The garage, at first glance, makes for a mundane symbol. And yet, Americans have imbued this deceptively "blank space" with a great deal of meaning. Even so, they may not fully understand that meaning, or its limitations. 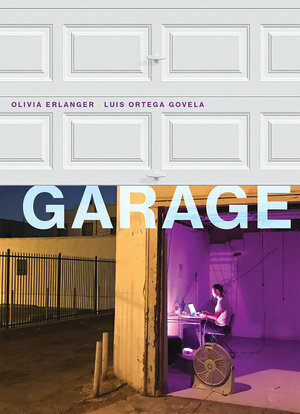 Olivia Erlanger and Luis Ortega Govela's book, a work of cultural studies, attempts to analyze the significance of the garage (i.e., the theoretical and material implications of the structure). They argue that Garage, an extension of their essay, Hate Suburbia: The Conspiracy of the Garage (2016), "is not a book about garages but about the power of constructing a space for fluid otherness" (11). Their work reveals a number of unexpected insights and connections and will appeal mostly to academic readers. American artist Erlanger and Mexican architect Ortega Govela have blended their skill sets to create what amounts to an extended essay on the history and mythology of the garage, liberally accompanied by their own garage-related artwork. Erlanger and Ortega Govela cleverly appropriate, deconstruct, and reconstitute found images that they intersperse with the book's main text. For example, Ortega Govela's IWoz features a photograph of a smiling inventor and tech guru Steve Wozniak superimposed over a depiction of the Apple logo filled with pride colors. One uncredited piece features Ayn Rand's passport photograph placed above the Disney logo. Garage's artwork is often imaginative and well rendered, making visual some of the ideas explored in the text. Along with adding to the aesthetic beauty of the book, the artwork helps to illustrate the authors' core theme: the ways in which the garage's promise of liberation from society's strictures have been repeatedly undermined by the structure's tendency to reinforce aspects of the status quo, especially those pertaining to gender and capitalism. Erlanger and Ortega Govela begin their study with the revolutionary architect Frank Lloyd Wright, the purported inventor of the garage. 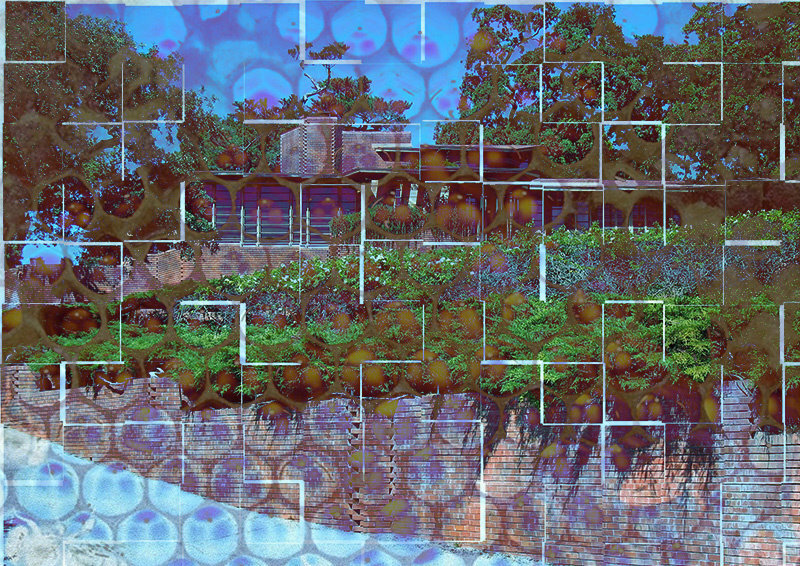 Focusing on the Robie House in Chicago, Erlanger and Ortega Govela situate Wright's innovation in the context of the emerging popularity of the automobile and the growth of the suburbs. The car, of course, was essential to the creation of the modern suburb, and Wright's garage aided in the acceleration of this trend. "Simply put," the authors contend, "the garage and the car it safeguarded were not only the technologies by which suburbia was devised but also the tools that allowed for suburbia to spread like a disease throughout the American landscape" (43). 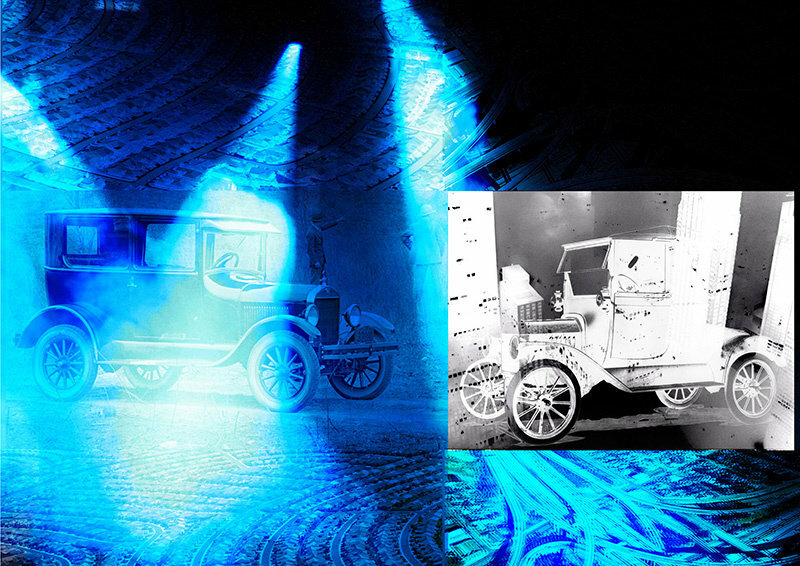 That "disease" would seep further into American culture after World War II, underwritten by federal government institutions and policies that encouraged homeownership and economic stimulation; the Federal Housing Administration, for example, offered mortgages to mostly white homeowners in suburban areas, but only for homes with garages. Thus, the connection between the car, the suburbs, and the garage was established. Erlanger and Ortega Govela address the obvious racism inherent in this trend, from the white-favoring policies of the government and private corporations to the phenomenon of "white flight", which added race to the list of the suburbs' homogenous elements. As the garage became an essential aspect of the suburban home, and therefore of the suburban lifestyle, its presence exposed the false dichotomy between the public world of work and materiality and the private one of domesticity that rows and rows of suburban ranch homes represented. "Through its economic value," Erlanger and Ortega Govela write, "the home reveals that it was transformed from a space of refuge to our primary financial asset." And, in the garage especially, "[the home] acted as a testing ground for corporate interests." This "entrepreneurial garage" was the world of Hewlett and Packard, Wozniak and Jobs, and so many others. Erlanger and Ortega Govela detail the myth of the individual genius on which the entrepreneurial garage rests. In fact, as they argue throughout the book, the garage, despite the countercultural, disruptive ethos that has so often driven economic activity within it, has always privileged self-making (i.e., individualism)—almost always by white men—over communitarianism and diverse perspectives. It makes sense, then, why garage-born startups like Apple, as evidenced by the company's individualistic branding, have actually buttressed the white patriarchal and economic order, rather than defied it. In one of the book's most interesting sections, Erlanger and Ortega Govela connect the concept of the "reality distortion field", or "the term that Apple employees used to describe Jobs's ability to make anyone believe in his dream of a future not yet founded" (119), with Ayn Rand's construction of heroes who "both created their own sets of rules and molded reality to fit their identities" (121). Erlanger and Ortega Govela are dubious of this kind of reinvention, but they assert that no site was better for it than the garage; after all, the structure was symbolic of the kind of individualistic refashioning promoted by both Jobs and Rand, and even, as the authors point out, by Frank Lloyd Wright, over whom Rand gushed. Erlanger and Ortega Govela's idea of the "garageification of space" is central to their treatment of Jobs. "Once home and work are garageified," they maintain, "there is an erosion between the domestic and productive spaces, where the dichotomy, language, and aesthetic of home and work borrow from one another" (83). In this way, any space can be infused with "a productive framework that facilitates both creation and consumption," ala "the co-working space, the Googleplex, or the organic café", leading to "frictionless capitalism" (97). Here, once again, we see, in this case through garagefication, the forces of capitalism finding new ways to thrive. Erlanger and Ortega Govela's brief, but damning, indictment of gentrification—featuring largely young affluent whites seeking authenticity through the selective adoption of both urban grittiness and the cultures of people who have been blocked from the fruits of suburbia—further demonstrates the problematic politics of the garage (98). In a chapter on the "Deprogrammed Garage", a theme invoked in their discussion of the Randian roots of the Apple garage, Erlanger and Ortega Govela further explore the reactionary potential of the structure. Referencing how Kevin Spacey's American Beauty character, Lester Burnham uses his garage refuge to combat the feminization of his home, the authors explore the phenomenon of the man cave. They logically see it as a totem of the modern crisis of masculinity, an event experienced by men who feel that they have been crowded out of the home proper. The garage, Erlanger and Ortega Govela declare, functions as the beleaguered man's "last bastion, the place where the macho can find certainty" (148). Far from sympathetic, Erlanger and Ortega Govela see this effort to hold onto and replicate toxic masculinity as decidedly destructive—something that should be resisted. For the authors, in a sly nod to Walt Whitman, "the most subversive means to free oneself of the cyclical nature of this abuse is to become pregnant: pregnant with ideas, possibility, to contain multitudes rather than a singular way of being" (149). Later in the book, Erlanger and Ortega Govela return to the theme of the garage and gender in a thoughtful take on the Barbie doll, the brainchild of Mattel, a company that was started in a garage. After highlighting the ways in which suburbia has been built on the uncredited labor of women, Erlanger and Ortega Govela detail Barbie as a symbol of freedom from traditional gender roles' constraints, comparable to the manner in which the automobile granted people freedom to escape the confines of their physical locations. Barbie's dollhouse, Erlanger and Ortega Govela point out, was notably lacking a kitchen or a washer and dryer. That made the doll the anti-housewife, symbolizing, along with the birth control pill, introduced shortly after the Barbie's unveiling, "the birth of a mechanized femininity, which would reproduce a sexuality divorced from childbirth" (174). Erlanger and Ortega Govela conclude their book by comparing the possibilities and perils of the Internet and the suburbs. Both promised an illusory utopian dream of new, robust communities founded on freedom of choice. In the case of the Internet, the authors suggest, "rather than confront opposition we use the virtual suburban neighborhood to remain safe within what we know, what is similar, seeing search results and targeted advertising that project back to us what is just like 'me'" (197). Nevertheless, Erlanger and Ortega, returning to the book's primary symbol, hold out hope that users will challenge the conformist, overly individualistic tendencies of the garageification of the Internet. The web might, in fact, be "used inappropriately", to push back against its stultifying effects so "that it can constitute new audiences, to form alliance or collisions across boundaries, bubbles bursting bubbles, refusing to appeal to a demographic" (199). It will be a tough battle, to be sure. The garage, in both its symbolism and materialism, reinforces the power of the white middle class, the demographic that helped to populate the suburbs and idealize the suburbs-garage linkage as central to the postwar American Dream. But, as Erlanger and Ortega Govela relate, the suburbs and their unique creation and incubator, the garage, are steeped in the ethos of individualism, even as their mythologies give lip service to the collectivist rhetoric of community-building. That individualism, a crucial element in the reinvigoration of capitalism, simultaneously reconstitutes and disguises the exclusionary nature of the garage. This important argument is, for the most part, credibly explicated throughout Garage. Not all of the authors' claims work, of course. Erlanger and Ortega Govela's discussion of how Kurt Cobain and Courtney Love "tried to use the garage to rebel against the normative history that created them, but found themselves caught reproducing the same idea of family that they had defined themselves against" (153-154) is a bit tortured and wanting for further analysis and evidence. Speaking of evidence, regrettably, the books lacks any citations or a bibliography. For a work that is so obviously the product of deep research into wide-ranging historical and pop culture sources, this seems like a serious oversight. Clarity can be an issue at times, too. The quirks of the cultural studies style of presentation are apparent in much of Erlanger and Ortega Govela's writing. Although their major arguments are laid out cogently and reiterated frequently, readers should not be surprised if they struggle more than occasionally to comprehend just what the authors mean. This issue can make sections of the book more of a slog to navigate than necessary. Still, more adventurous, academically minded, readers should not be discouraged. Erlanger and Ortega Govela are currently expanding their book's multimedia approach to the garage into an in-development documentary. If the book is any guide, the film will be an intellectually and visually rich meditation on the beguiling, energizing, and yet limiting power of the garage as a symbol of escape and reinvention. As a model of historically informed cultural studies, Garage warns us to be wary of romanticizing this one-of-a-kind space, even as it underscores why we are so tempted to do just that.